It was an embroidery weekend at my house. 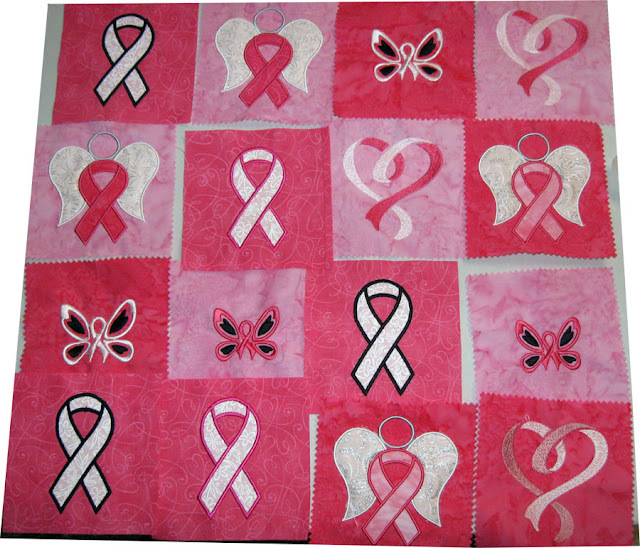 I am just about completed with all the extras I like to add to the Breast Cancer quilts. I love adding embroidered blocks of different sizes and styles. This year, my favorites are the applique angels. I used frosted fabrics for the wings. It added just the right amount of sparkle! I need about 16 extra (8 for each quilt) plus the ribbon corner blocks which are the basic ribbon applique blocks below such as the top left one. Really beautiful. Great job Trish.